While the people of Virginia, under the leadership of Patrick Henry, arose against King George’s Stamp Act, they were not alone in the feeling of opposition to the English King. Just as brave and liberty-loving were the Massachusetts people, with Samuel Adams as their leader. 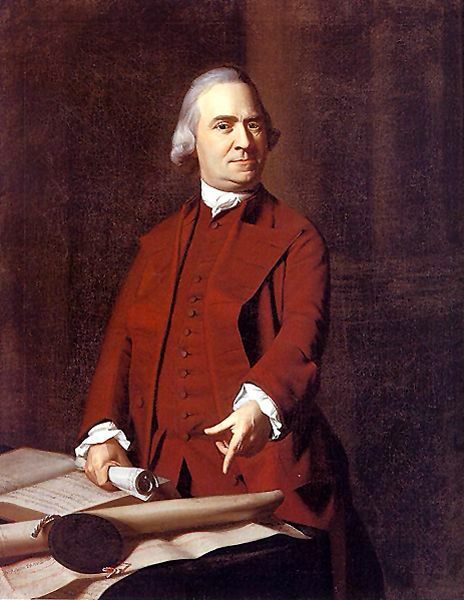 Samuel Adams was born in Boston on September 27, 1722 to Samuel Adams, Sr., and Mary (Fifield) Adams. Though he was one of 12 children born to the couple, only he and two others would live beyond the age of three years. Adams’s parents were devout Puritans, and members of the Old South Congregational Church. His father was a prosperous merchant and church deacon who became a leading figure in Boston politics. Of Samuel Adams’s boyhood, there is little known; however, he appeared to have been a studious, in-door sort of boy, with little fondness for sport of any kind. During his youth, he attended Boston Latin School and then entered Harvard College in 1736. After graduating in 1740, Adams continued his studies, earning a master’s degree in 1743. After leaving Harvard, his parents hoped he would become a minister, however, Samuel was more interested in studying law. His mother did not approve, and so he moved on to business, eventually joining his father in the malt business. But, Adams real passion was politics, and he showed little interest in making money. In January, 1748, he and several friends, inflamed by British impressment (forcibly inducting men into military service), launched the Independent Advertiser, a weekly newspaper that printed many political essays written by Adams. These early writings emphasized many of the themes that would characterize his subsequent career. That same year, his father died, and Adams took over the management of the family’s affairs. In October, 1749, he married Elizabeth Checkley, and the couple would eventually have six children, only two of which would live to adulthood. Following in his father’s footsteps, Adams embarked upon a political career. After serving as a clerk in the Boston market, he was elected to the post of tax collector in 1756, which provided a small income. Because he often failed to collect taxes from his fellow citizens, he “failed” in his duties becoming liable for the shortage. But, he was popular with the people, who helped to pay off the debt and Adams emerged as a leader of the popular party. In July, 1757, Samuel’s wife Elizabeth died soon after giving birth to a stillborn son. Several years later, he would remarry in 1764, to Elizabeth Wells, but, the couple would have no other children. When the Sugar Act was implemented in 1764 and the Stamp Act, the following year, Adams was a major opponent, arguing that the acts were unconstitutional, stating that they would hurt the economy, and supporting boycotts to repeal the taxes. By this time, Adams was 42 years-old and having never shown very much aptitude for business, he had lost most of the property his father had left him. In fact, he soon gave up all kinds of private business, devoting his time and strength to public life. As a result, he and his family had to live on the very small salary which he received as clerk of the Assembly of Massachusetts. Despite how poor he was, he couldn’t be bought by the British, always sticking to his Puritan values. 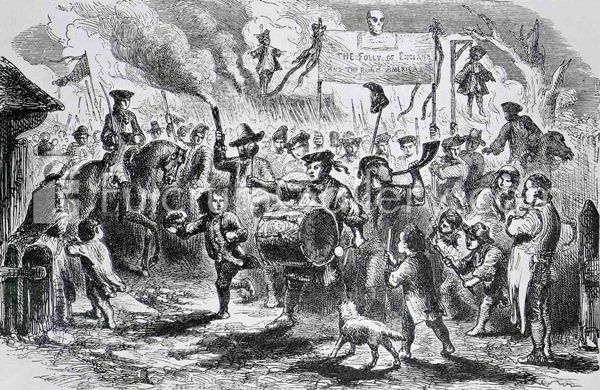 After violence erupted over the Stamp Act and colonists compelled stamp distributors to resign, British merchants were able to convince Parliament to repeal the tax. But, this would not be the end. Parliament would soon take a different approach to raise revenue, passing the Townshend Acts in 1767. These acts established new taxes on various goods imported into the colonies, including glass, lead, paper, and tea. 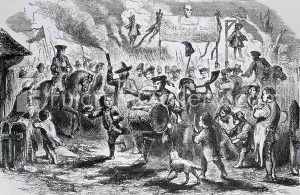 Resistance to the Townshend Acts grew and Adams soon organized a boycott in Boston. Before long, other towns in Massachusetts, Rhode Island, and Connecticut had joined the boycott. The opposition to the new taxes was just as bitter as it had been against the Stamp Act. Samuel Adams urged the people of Boston and Massachusetts to join in refusing to import any goods from England as long as the new taxes were imposed by Parliament. They did so agree, and thus inflicted great injury upon English merchants, as they had done two or three years before. Of course, these merchants suffered heavy losses, and again begged for a repeal. But, King George could not understand the Americans; and where, he had thus far, not been able to coerce them; he now made a shrewd attempt to outwit them. Influenced by the King, Parliament took off all the new taxes except the one on tea. “There must be one tax to keep the right to tax,” the King said. If he could only succeed in getting the Americans to submit to paying any tax—no matter how small—that Parliament might levy, he would carry his point. He therefore urged not only the removal of all taxes except the one on tea, but, also made arrangements whereby Americans could buy their taxed tea cheaper than it could be bought in England and cheaper even than they could smuggle it from Holland, as they had been doing. No doubt the King had great faith in his foolish scheme. “Of course,” he argued, “the Americans will buy their tea where they can buy it cheapest, and then we will have them in a trap.” But, this would be a huge blunder. It was a quiet Sunday morning, on November 28, 1773, when the Darmouth, one of the three tea-ships on the way to Boston, sailed into the harbor. The people were attending service in the various churches when the shout, “The Darmouth is in!” spread like wildfire, and soon the streets were astir with people.